I cut my hair three weeks ago, destroying all chances of actually mimicking Wolverine's hair. And my attempt to grow some wicked chops was about two weeks shy of any justice. So showing up to a Halloween party as I was turned out to be distressing. Many asked what I was supposed to be. "Oh, Ren McCormack, I get it!" or ""Why didn't you dress up?" were my most frequent comments. 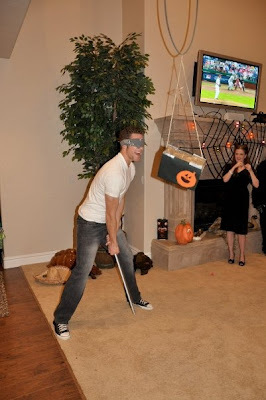 Overall, I was a costume-failure and disgrace to Hugh Jackman. I literally walked into the pinata event. Walking aimlessly, and alone, through Jared Bryson's home I bumped into an acquaintance who handed me a bandana and walked away. I was soon given a stick and was being forced to spin. 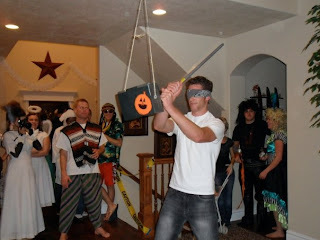 I was humiliated as I swung about, trying to hit a box-shaped pinata made of duct tape. Yes, duct tape, meaning that it was physically impossible to tear it open with a swing of a small plastic bar. The bar literally almost left my hands several times because I was swinging so hard that my hands began to sweat. I somewhat gave up, grabbed the string, pulled the box close, and beat it like a dirty rug...and it still didn't break open. Public humiliation at its finest. Halloween 2009 brought with it some good memories and gave rise to a new pet peeve: people who use this holiday as an excuse to lower dress standards. Drives me crazy. Thank you Brady! I totally agree with your pet peeve...people think anything goes for that one night and I hate seeing that! What? Everyone know's that Halloween is the best garment-optional holiday.